Bears rarely enter occupied tents or wreck entire campsites, but, when they do, it is most often because the people camping in that camp site or at a nearby site, have not taken appropriate cautions to ensure that they have a proper clean camp. If there is even one scrap of food for the bear to access in the camp it will most likely search the rest of the camp and the surrounding area for more food. A bear’s sense of smell is over two thousand times greater then a human’s and, even seven times greater then a bloodhounds. They are thought to have one of the best, if not the best, olfactory senses on the entire planet. Every year camper’s leave out bits of dinner on picnic tables; they try to burn what they haven’t eaten in the fire; or they keep, in general, an unclean camp. While it is hard to help others to be responsible, here are a few tips for keeping a clean camp so that you can ensure that you are doing your part to not lure in potential bears into your camp or into someone else’s. Proper food storage is very important to keeping a clean camp. Your food should be sealed in containers (preferably bear proof containers), and, if you are car camping, possibly leave it in the car near your campsite. Never store any of these things inside the tent. Food and even items like deodorant should never be kept within the tent. You don’t want to give the bear a reason to come over to inspect your tent, if, indeed, one has merely wandered into camp. If you are cooking foods that have strong smells – sausages or bacon and eggs – make sure to cook the food quite away from your camp. Bears cant resist the smell of sausage and bacon any more then you can, so having those odors as far away from where you sleep as possible is vitally important to preventing a possible encounter. Also, many developed campgrounds now use bear proof garbage bins. Make sure that if you have garbage, do not leave it in a garbage bag, dangling from a nearby picnic table overnight. Throw it away. While we cannot prevent bears from wandering into a campsite, we can prevent them from lingering, and, possibly, destroying our camp or being aggressive towards us or our neighboring campsite. 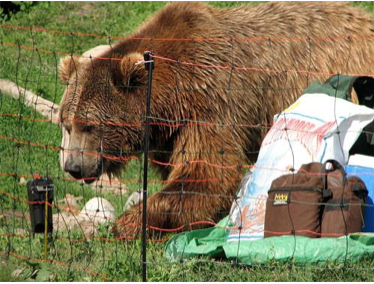 Another option is to use the UDAP Bear Shock fence at your campground site for protection from Bears. Backpacking into remote areas of the west is both fun and rewarding. There are many challenges the hiker can face on a pack trip, and he should always be prepared to encounter anything from unpredictable weather, injury, or even an encounter with a bear. One way that a hiker can be more prepared is to properly load his pack, and also to have his pack fastened correctly about his upper body so that the pack is merely an extension of him. Remember, in the backcountry, your backpack is your lifeline; it is responsible for protecting your food, shelter, and clothing. A hiking backpack should not be worn like a school child’s pack. 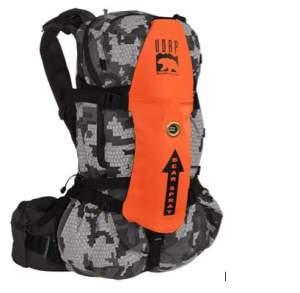 The hiking backpack is meant to carry much of the load of the pack on the hips and not on the shoulders. When you put on your pack, adjust the shoulder straps first, as this will lift the pack into position over your hips. Then tighten down the waistbelt. The waistbelt needs to be tight, but not so tight that it cuts off the circulation to your legs. The load straps should be tightened to a forty-five degree angle. If these straps are cinched in tight it will pull the shoulder straps of the pack into your skin. While there is no one absolute correct way to load a backpack, there are some basic guidelines that will ensure that the load in the pack will travel comfortably throughout the hike. First of all, place the items that you wont need until you camp like light clothing, and a sleeping bag and pad in the bottom of the pack. If you are hiking in bear country make sure to keep items like toothpaste, food, or even sunscreen away from these items that you will be using at night. Bears have a very keen sense of smell, and you do not want the smell of these items in the tent with you at night. Above the lighter items, you will want your heaviest items. These items ideally should be loaded close to your spine in the middle of your back. The Food, water supply, and stove can all be placed in this area of the pack. You can place your tent, rain jacket, and other soft necessities that you may need in an emergency around the heavy items to prevent any possible shifting. Another option is a UDAP Bear Proof Food Container for storing food from bears. Hiking, camping and backpacking are all excellent ways to experience the wonder of the Great Outdoors. However, it can also be a dangerous way to witness Mother Nature in all her fury. Simple common mistakes made hastily can have inconvenient and even disastrous consequences. Here we explore some common mistakes average people make when enjoying nature. Whether you forget to bring a map and determine your route beforehand or you make a rookie mistake like not bringing enough water, you could add hours or even days to your trip if you get lost — no to mention lose expensive equipment along the way. That’s why it’s crucial to sit down before hand — even with a hike that you’ve done many times before — and map out your route, procure rations and make sure you have the proper gear. You may think you can handle a bigger workout than you’re actually trained for because at the bottom of a mountain, anything seems possible. Halfway up and you may reconsider. By then it could be too late and you’re already committed to the summit run. Pay attention to marked trails and their ratings. Don’t go for an intense trail with lots of climbing and scaling if you’re just out for a casual scenic hike. Instead, pick a trail for your fitness level and gradually work your way up in ratings over time. Also, don’t go off the marked trail. Doing so could send you on a route that could get you lost in no time. One of the biggest mistakes in camping in particular is not testing out equipment such as grills, tents and even sleeping bags beforehand. Before you head out on your trip, make sure the grill works and that you have enough propane to fuel it. Nothing kills a good camping buzz faster than hungry kids huddled around the grill mad at Dad who can’t get the darn thing to work. Set up the tent in the backyard before going, too. Make sure you know exactly how to put it together to save yourself the hassle of wrestling with directions at the camp site. Pack all components of the tent with you, including rain covers and stakes, so you’re well prepared. Most people know not to leave out food at a campsite, especially at night when asleep, so that bears and other large animals don’t come a-hunting. But most people don’t realize that many critters, such as raccoons and squirrels, are attracted by the smells of toiletries like toothpaste, soap and bug repellant. Keep these securely packed away as well to avoid unwelcome visitors. Be careful on your next hiking or camping trip by preparing beforehand so you can have the most enjoyable time possible. Spring is definitely here and so is the start of camping season. It’s also the time that bears are coming out of hibernation and they are hungry. Avoid problems while camping in grizzly bear country. Not only should you be carrying UDAP Bear Spray, but you should also have a UDAP Bear Shock Electric Fence! UDAP Bear Shock Electric Fence. In bear country? “Bear” down with some shockingly effective electrical protection! MADE IN THE USA! Lightweight, portable, and adaptable… plenty of wire for up to a 27 x 27′ area! Hey, any bear specialist will tell you that bears who willfully enter a camp are either predatory, or have become used to eating human food. Either way, it’s a dangerous situation. Wouldn’t you rather sleep soundly knowing that you’re protected within the electrically-charged fence of the UDAP Bear Shock Fence? The whole System fits neatly inside a 5 x 20″ bag, and at just over 3 lbs., it’s perfect for backpacking! It easily adapts to any terrain… simply set up your perimeter, fit the poly wire onto the corner posts, and hook up the energizer power source (two D batteries, which can provide up to 5 weeks of power), and you’re good to go. Everything you need is right here, in one bag. So if you want to sleep easy in bear country, hook up this Electric Fence and send bears packin’ with 6,000 volts! You are taking a nice hike through the woods and all of a sudden you find yourself face-to-face with a bear. 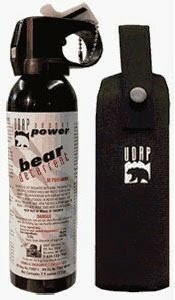 Be sure to prepare yourself the next time you hit the trail in bear country, carry UDAP Bear Spray! 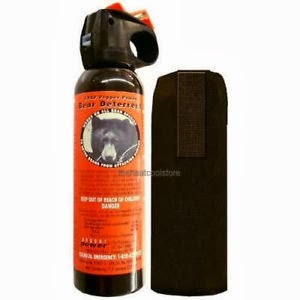 Bear pepper spray deterrent is proven your best defense in stopping a bear attack. Remember to carry your bear pepper spray where it is accessible and you know how to use it. You will be relying on your reflexes to help you get your spray deployed into the face of a charging bear. Practice several times going for your spray. This simple step can save your life! The polar bear is one of the official mascots for the Winter Olympics that starts February 7th and runs through the 23rd. The polar bear is one of three mascots-a snow leopard and the doe hare are the other two. They are the first mascots ever that won their spot in history by popular vote. They will be seen throughout Sochi! Sochi is located in Krasnodar Krai, Russia. Sochi is a popular tourist destination because of its breathtaking location by the Black Sea. The city is also located directly by the border of Georgia and Abkhazia, the first of which has experienced constant violence such the fall of the Soviet Union in the 1990’s. Sochi is a prime travel destination because of its warm summer temperatures and mild winter temperatures, making it a fun destination no matter the season. Russia is one of the nations where polar bears can still be found. Polar bears live in the Arctic in areas where they can hunt seals at openings in the sea ice called leads. There are five nations with polar bears: U.S. (Alaska), Canada, Russia, Greenland, and Norway. Polar bears do not live in Antarctica. Penguins do. We’d like to say, “Good luck!” To all of the participants in the 2014 Winter Olympic Games!